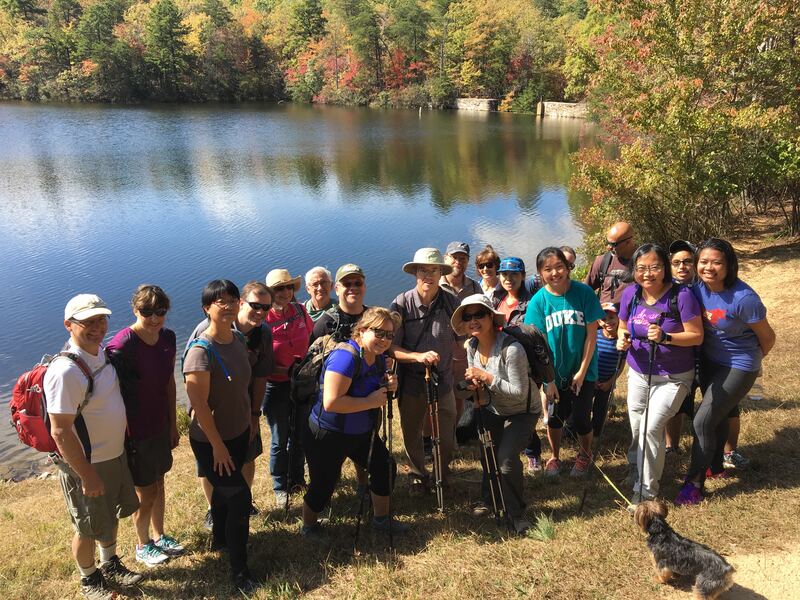 Fall 2018: Hike, Camp, Backpack with us - GetGoing NC! This fall, we’ve got four weekend camping/hiking trips planned to some of the best hiking in the mountains, and one late fall trip to some pretty cool hiking at the coast. Experienced Camper. These weekends are geared to established campers, folks who have the gear and have the process and logistics — packing, setting up camp, cooking food — down. We arrange the campground and guide the hikes, we cook one meal, we provide a fun swag bag and you do the rest. Newbie Camper. 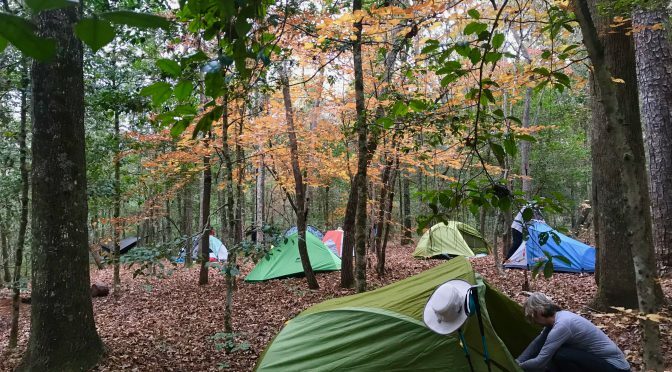 These weekends are geared toward people new to camping, people who like the idea of camping, but don’t know where to start. Well, you start here, with us. We arrange the campground, cook the food, arrange activities. All you really need is a tent (and if you don’t have that, we have one of those, too, for an additional fee). Feel free to hang with us and learn the ropes, or kick back, relax and let us do the camp work. What we love about these trips is that there’s time for both great hiking and relaxing. Arrive anytime after 4 p.m. on Friday, get established, settle in, relax. Saturday, we let you sleep in, hitting the trail between 9 and 9:30 a.m. Saturday’s hike is usually in the 10-mile range, a long day on the trail, but without pushing it. Sunday, we sleep in a little later and hike a little shorter, usually around 5 miles. Mount Rogers, Sept. 21-23. Pampered Camper. Grayson Highlands State Park, Virginia. 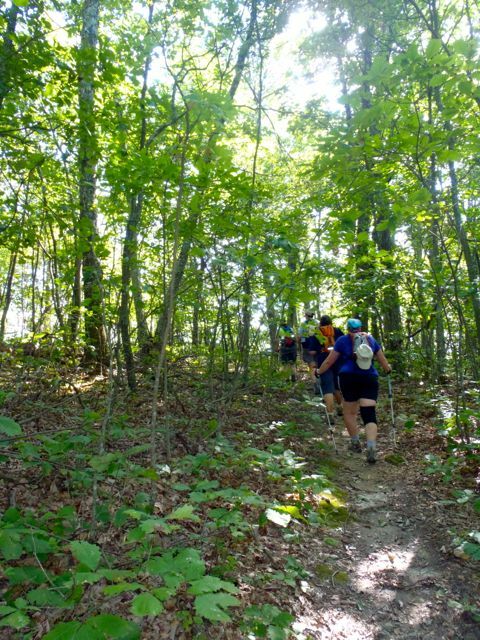 Includes a hike to Mount Rogers, at 5,724 feet the highest point in Virginia, and an optional bike ride on the 17-mile Virginia Creeper Trail, nearly all of which is downhill. (If you’re not interested in the bike ride, a hike is planned in its place.) The Mount Rogers area is known for its vast meadows, rock outcrops, Rocky Mountain feel — and ponies. Curtis Creek/Graybeard, Sept. 28-30. Practiced Camper. Pisgah National Forest and Montreat Wilderness. The Curtis Creek campground is in the oldest section of the Pisgah National Forest, dating back to 1913. On Saturday, we’ll summit 5,592-foot Graybeard Mountain in the adjoining Montreat Wilderness; Sunday, we’ll hike from the campground up the Hickory Branch Trail into some of the oldest old growth in the Pisgah. New River State Park, Oct. 12-14. Pampered Camper. This trip gets a jump on fall color in the mountains by visiting two of the highest points in North Carolina’s northern mountains: 5,520-foot Elk Knob and 4,655-foot Mount Jefferson. Due largely to their high elevation and rich soils, both peaks offer a fall color experience more akin to that found in New England. Mount Mitchell, Oct. 19-21. Practiced Camper. From base camp at the Briar Bottom Group Campground at the base of Mount Mitchell, we’ll hike from camp up to the Green Knob Tower on Saturday, an 8-mile roundtrip that culminates with great views of the Black Mountains. Sunday, we drive to the highest point on the East Coast, 6,684-foot Mount Mitchell, for a hike on the Black Mountain Crest Trail. Includes a burrito dinner Saturday evening. Outer Banks, Nov. 2-4. Basic. What better way to close out the fall hiking season than with a trip to the coast. Base camp for the weekend is the National Park Service Campground at Oregon Inlet. From there, we’ll head a short distance up the coast and hike 5 miles through maritime forest at Nags Head Woods Preserve. Sunday, we’ll visit some of the oldest and biggest trees in the state on a 5-mile hike at Pettigrew State Park. Learn more and sign up here. To learn more about the camping weekends mentioned and to sign up, click the appropriate trip. Since its launch in 2014, GetBackpacking!’s Intro to Backpacking program has minted more than 200 backpackers. With all those backpackers, we eventually had to offer more advanced skills classes and trips. So, if you’re already a backpacker, if you want to be a backpacker — even if you just think you want to be a backpacker, we’ve got something for you this fall. Intro to Backpacking, September, October sessions. Our comprehensive learn-to-backpack program includes a two-hour session on gear and how to pack a backpack; a six-hour session at Morrow Mountain State Park where we go over everything from finding and setting up camp, to cooking, to hanging food, to breaking down camp; and, finally, a weekend graduation trip to South Mountains State Park. Learn more and sign up here. GetBackpacking! Overnight Sampler, Sept. 15-16, Oct. 20-21, Eno River State Park, Durham. You like the idea of backpacking, but you aren’t ready to make a full-on commitment — you’d like to take a test-drive first. 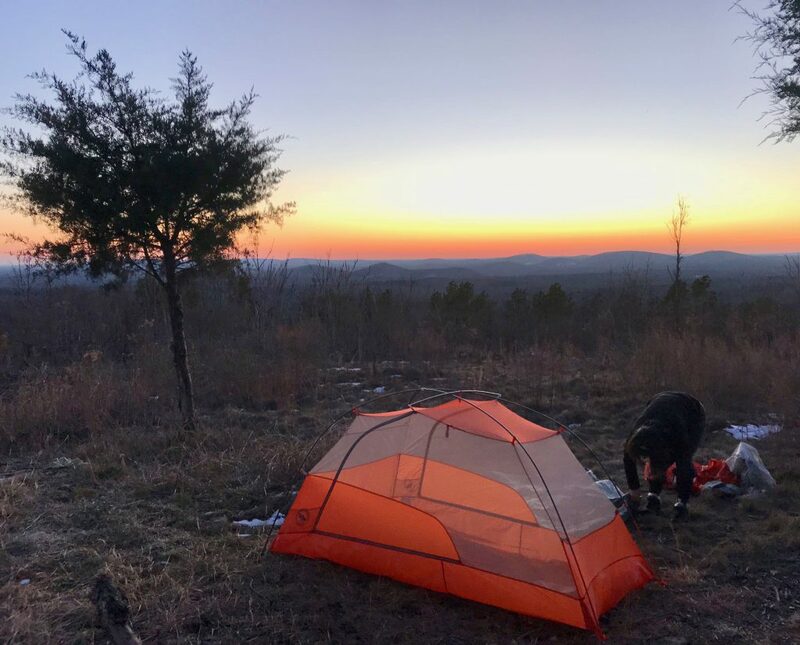 That’s what our Overnight Sampler is all about: we provide the key backpacking gear and food, you get to see what it’s like to hike in a full pack and camp in the backcountry overnight. Learn more and sign up here. GetBackpacking! 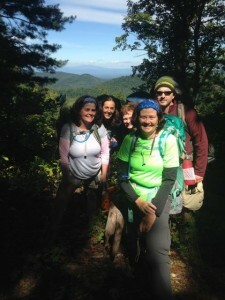 AT from Carvers Gap to 19E, Sept. 21-23, North Carolina/Tennessee line. A two-night, three-day 14-mile trip that may be the most scenically spectacular run of trail in North Carolina. We start at Carvers Gap and top Jane and Round balds right off the bat, meander through forests of mountain ash, then encounter more stunning views from atop Little Hump and Hump mountains. Learn more and sign up here. GetBackpacking! 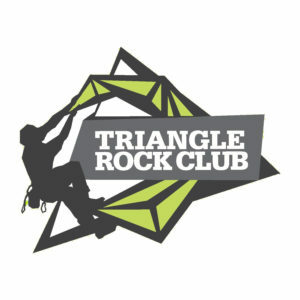 Intro to Linville Gorge, Oct. 5-7. We’ve twice done an Intermediate Skills trip to Linville Gorge, attempting a 20-mile look along the east rim and up the gorge: it’s one rewarding (and intense) immersion into the gorge. On this trip, we take a more relaxed approach, setting up basecamp on Shortoff Mountain, then day packing into the gorge. Learn more and sign up here. Joyce Kilmer/Citico Creek Wilderness, Oct. 25-29. Joyce Kilmer-Slickrock and the adjoining Citico Creek Wilderness in Tennessee were no-brainers for inclusion as designated Wilderness Areas because so little has changed in the region since Spanish explorer Hernando De Soto came through the area in the early 1500s. Too rugged even for timbering, the rugged area retains its primitive feel amid its old growth forests. We’ll spend three full days exploring the area. Learn more and sign up here. Neusiok Trail, Nov. 30-Dec. 2, Croatan National Forest. What better way to wrap up the 2018 backpacking season than with a trip on the 21-mile coastal Neusiok Trail. In early December, the stillness and quiet of these coastal woods offers an overnight experience you likely haven’t had. Learn more and sign up here.